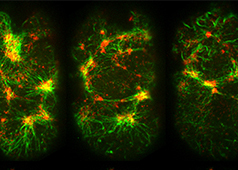 Crosslinking of actin filaments is a critical step in cell motility and is a fundamental process in filopodia protrusion and lamellipodia formation. Smaller cross-linking proteins that are more globular (e.g. fascin) or have more than one actin binding site (e.g. fimbrin, α-actinin dimers) primarily form actin bundles. Larger crosslinking proteins (e.g. spectrin, filamin, dystrophin) create more space between actin filaments and they generally form actin networks. Other actin crosslinking proteins not shown here include: scruin, dematin, and villin. In filopodia, crosslinking of actin filaments provides the rigidity needed to overcome the compressive force of the plasma membrane, which individual actin filaments otherwise lack  . Filopodia in nerve growth cones contain tightly packed bundles of actin filaments that usually contain more than 15 parallel filaments. These are likely to be oriented with their barbed ends towards the tip . Mechanically, a crosslinked filopodial bundle functions as an effective elastic rod. Bundle stiffness increases with the number of bundled filaments and so contributes to the overall filopodium length . In lamellipodia, crosslinking also strengthens the actin filaments, however in this case the filaments form a branched network, which is connected at certain points to membrane bound proteins and focal adhesions (as depicted in Fig 1). Crosslinking also increases the ATPase activity of myosins and increases the tension on actin filaments .